Today we leave for the long drive out west to Ohio for the swap meet at Memory Lane Classics. It is held the field around there bicycle shop in Grand Rapids. Some years the weather has been beautiful, other years we have been stuck with freezing rain. This weekend doesn’t look too bad, with only scattered thunderstorms. The weather is an important factor for any swap meet, but I look at the forecast even closer as I know I am in that field from Thursday night until Saturday afternoon. We either sleep in the van or if the weather permits it, out in the field, under the stars. It is predominantly a classics bicycle swap meet, catering towards balloon tire and 1960s kids muscle bikes, but anything can show up there. We travel around the country looking to buy basic bikes to sell at the shop for commuters and college kids, but we are also collectors and love seeing, and buying, unique and interesting stuff. I like vintage lightweights from the 1930s-1960s, especially weird parts. I have a small saddle collection of different aluminum frame racing bike seats. Curtis interests are much wider, from high wheelers to modern mountain bikes, he collects everything. Curtis even has a valve cap collection on display at the shop. After Memory Lane, we drive up to Ann Arbor Michigan to half indoor/half outdoor swap meet there on Sunday morning. That starts with the getting there early on Sunday morning to seat on line in our vehicles before sunrise, waiting for the gates to open at 7am? From there, we spend all day buying, selling, looking, and smoozing. 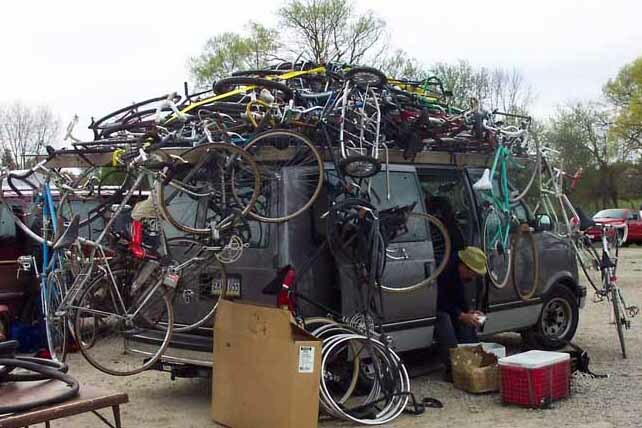 Last year the van was pretty loaded and people we coming over and taking pictures of our “pile.” Every bicycle, frame, and part in the picture is something we bought while out west last year. Then it is the long journey home, from Michigan back to Philly. To the average driver, not that big of a deal, just long. But with a few tons of bicycle parts crammed inside and attached on and around the van, the driving is a bit labored. Of course, there is also the unpacking on Tuesday, when the rattling of 11 hours or so on the road has crammed the bikes together even tighter!